A Titanic Commemoration Service took place at Belfast City Hall on Monday. A commemoration service took place at Belfast City Hall on Monday to remember the 1,512 men, women and children who lost their lives on board the Titanic. President of the Belfast Titanic Society Susie Millar joined Lord Mayor of Belfast Deidre Hargey to lay wreaths at the Titanic Memorial in City Hall grounds. Marking the 107th anniversary of the tragedy, the short service was conducted by the Reverend Ian Gilpin, Non-subscribing Presbyterian Church in Comber, with the Lord Mayor’s Chaplain, Reverend Karen Sethuraman, saying a short prayer. Presiding over the service was Dr Aidan McMichael, Chairman of Belfast Titanic Society. The Lord Mayor said “the tragedy of the Titanic is very close to home for the people of Belfast". "Many of our citizens were on board when she went down and are remembered by relatives who have gathered with us to mark this occasion," Councillor Hargey said. “The Olympic-class ocean liner was one of our finest, built by local craftsmen and remembered across the world for her top class design and engineering. Dr McMichael said the anniversary offered an opportunity to remember those who died. "The Titanic Memorial Garden at Belfast City Hall is a fitting backdrop to the annual Titanic Commemoration Service held each year on the 15th April," she said. "This year marks the 107th anniversary since the loss of RMS Titanic. As we in Belfast continue to develop the story of design, construction and launch of RMS Titanic, the Ship of Dreams, the Titanic Memorial Service remains a special time to remember all those who were lost in the tragedy." 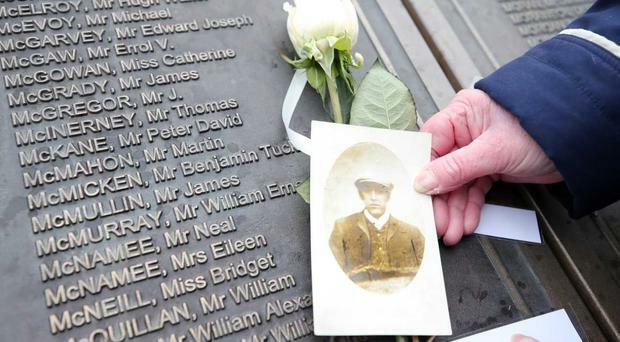 Invited guests to the Commemoration Service included members of Belfast Titanic Society and relatives of some of those on board RMS Titanic who also laid white roses at the Titanic Memorial Garden’s memorial plinth to remember loved ones. The Titanic Memorial Garden commemorates the 1,512 men, women and children who died on the RMS Titanic’s maiden voyage in the early hours of 15 April 1912. The garden’s memorial plinth supports bronze plaques which list, in alphabetic order, the names of those lives that were lost.